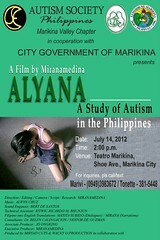 “Alyana -- A Study of Autism in the Philippines” is the first documentary film on autism in the Philippines by independent film maker, Miranamedina. The film has been showing all through-out the Philippines, in cooperation with ASP Chapters since 2006. The trailblazing film was screened at the Cinemanila International Film Festival in November 2006 and at the 3rd Festival on the Issues Concerning the Mentally Challenged in New Delhi. For more information regarding the Marikina film showing, you may get in touch with Marivi at (0949) 398.3672 or Tonette at (02) 381.5448. To request for a showing of “Alyana” in your area, please email autismphils@gmail.com. Or call (02) 926.6941 or (02) 929.8447 for more information. Contribute to ASP Programs and Services -- donate to Autism Society Philippines, Metrobank Kamias Branch Account No: SA 047-3-04751874-2.